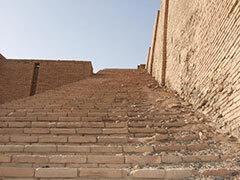 The steps -- reportedly part of Pontius Pilate's palace – were believed to have been brought to Rome from Jerusalem in the 4th century by Helena, Emperor Constantine's mother. ABC News reports after more than a year of restoration, the 28 steps of the "Scala Sancta" or Holy Stairs, of the Pontifical Shrine in Rome, was unveiled by the Vatican last Thursday. The stairs have not been seen without their wooden protection for almost 300 years. Their opening comes just in time as thousands of people will visit Rome and the Vatican for Easter. Housed in a building across from the Basilica of St. John the Lateran in Rome, the stairs were brought from Jerusalem to Rome in the fourth century by the Emperor Constantine's mother, St. Helena after Christianity became the religion of the Roman Empire. Since the Middle Ages, millions of Believers have climbed the stairs on their knees to pray and meditate on Christ's passion. "The newly restored frescoes help the faithful connect with the holy history," Father Francesco Guerra told ABC. For the next two months until Pentecost, pilgrims will be able to ascend the bare marble Holy Stairs on their knees. They had been encased in walnut wood for their protection since 1723, according to ABC. Before the stairs were opened Thursday, restorers working for the Vatican Museum described what it was like to uncover the original stairs, which contain three small bronze crosses embedded in the marble and spots believed to be stained by Jesus' blood. The restorers also described finding large furrows running along each step, which they explained were caused by the toes of pilgrims' shoes as they knelt and rose to move up to the next step over the course of centuries.